So I just got down to playing GTA V and I thought I might as well blog about it.. So here I am, blogging about it. Now I am a newcomer to the GTA franchise so I can’t compare it to any of the previous ones but I can compare it to other ‘open world’ ‘sandbox’ games I have played before. There are two things I noticed and loved about playing it straight away. First was the space. It’s amazing! As someone from the UK, just seeing large roads feels spacious but GTA takes it to the next level. The freedom is so fun. The second thing is the cinematic quality. The game opens with you being thown into a mission nine years ago. 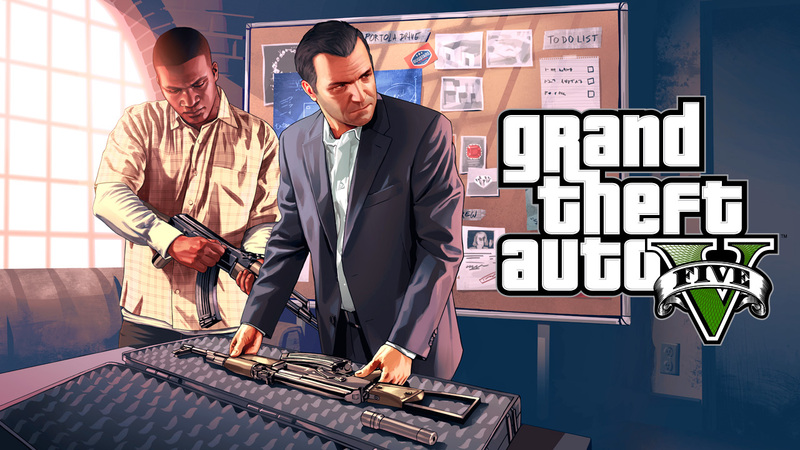 After ‘completing’ the mission you are sent to the present day, where the words ‘Grand Theft Auto’ are printed on the screen. And from then you can tell that this game conducts itself like a movie. And parts of it even feel like a movie. Anyway I suggest that you play this game (if you haven’t already) because it is really fun to shoot things and steal cars. More fun than it should. be.